A recent study published in the Annals of Internal Medicine investigates what knowledge we have on hospital cleaning methods. The study focuses on three categories: what agents and methods are used to clean hard surfaces, what approaches are available to monitor cleaning, and what system-level factors are required for cleaning in order to be successful. Researchers analyzed 80 studies that were published between 1998 and 2014, comprising 76 primary studies and four systematic reviews. The systematic overview of studies revealed a lack of evidence on the best ways to protect patients’ health. In fact, most of the studies focused on before and after results using a single cleaning agent. More than 65% of the studies focused on surface contamination as the principal cleaning outcome, while less than 35% reported on patient outcomes, such as hospital-acquired infection (HAI) rates. A few of the studies did reveal how the rates of HAI Clostridium difficile—a hospital-acquired germ that can cause gastrointestinal infections—fell when bleach-based disinfectants were used. Six studies showed favorable results when using cleansing wipes dampened with hydrogen peroxide and other chemicals—the use of these wipes reduced HAIs. Finally, researchers discovered that using copper coatings in hospital rooms could effectively kill bacteria and reduce the risk of infections. Study authors are hopeful that their review will illustrate the importance of hospital cleanliness. The Centers for Disease Control and Prevention states that one in 25 patients suffer from HAIs during their hospital stay. Han, J., et al., “Cleaning hospital room surfaces to prevent health care–associated infections: a technical brief,” Annals of Internal Medicine, doi: 10.7326/M15-1192, http://www.ncbi.nlm.nih.gov/pubmed/26258903, published online August 11, 2015. 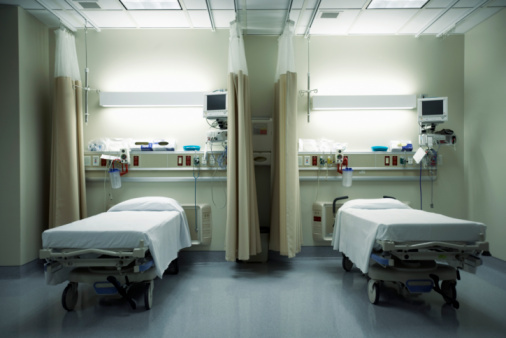 Lam, P., “Studies fall short on identifying best cleaning methods for preventing hospital infections,” Medical News Today web site, August 12, 2015; http://www.medicalnewstoday.com/articles/298056.php.